Team Concept of working together toward a common goal. They are also often used as a "reward" for a job well done! If you're looking for an effective, fun way to bond with colleagues, a Team Concept Cooking party is a unique team-bonding exercise that will leave you and your guests smiling long after the cooking is done. As your team members learn essential culinary techniques and master new recipes, they also strengthen bonds and relationships in a fun, informal setting. We will design the event to meet your demands and budget. will consult with you to create the perfect menu for your group. commercial range and natural gas grill. entertaining task together, then sit down to enjoy the fruits of their labor. We present our Team Concept Cooking Class situations for your employees as a way to encourage cooperation, not to foster competition. or just a special thank you. in our focus" Will B.
helped bring my work group together at an important time." B.K. my ability to communicate with each of them much better" D.L. "My team is still talking about the fun they had, 6 months later! I am convinced we are closer now and work even better together" J.H. to Tucson and these events are a big part of the reason. We'll be back for many more." If you like, we can also arrange to come to your location. 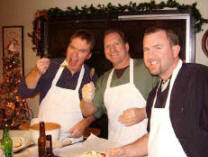 your private Team Building cooking class. during the cooking portion, then joining all together for dining. Copyright www.CuisineClassique.com. All Rights Reserved.